Well....not really. But tomorrow my son and I are driving to Knoxville, TN. My sister, her family and my Mom all live there. While driving my Mom's car to Knoxville, we will stop for an overnight visit with my daughter in Nashville. Then drive on to stay and visit with my family in Knoxville and then return home on Sunday. It will feel like a jet plane trip....fast and hurried. I can't stay longer as my son has to go to Chicago to visit his girlfriend Amy....and you all know that I have work to do. Leave a comment if you want one and when I return on Monday I will draw two names. One pillow each is the prize. These were done by Moda fabrics for Blackbird Designs. They were released with our Beach House fabric line. I should have ironed the rick rack down in place...I promise I will do that before sending these out. Each pillow could be used as a pincushion or placed on a shelf. Don't we all need one more alphabet? Hope all of you have a wonderful weekend...."see" you on Monday. I would love a pillow, have tons of fobs but very few pillows that could be used as a pincushion. (some of my poor fobs are serving double duty.) Enjoy your family visit, TN is beautiful in the summer. I just love the cross stitch pillows. Just beautiful! Safe travels, and enjoy TN! Have a safe trip to Knoxville & enjoy the time with your boy!! The pillows are too cute and would look awesome!! Love those pillows. I am sure I could find a place for one of them. Travel safe. Thanks for your generosity. I love the little cross stitched pillows, please please enter me into your drawing. Have a great trip and take lots of pics! Don't know where my post went. I would love a little pillow. Love all your stuff, hope to see you at Boxwood and Berries. ROAD TRIP!!! Gotta love it! Be safe and ENJOY! Have a safe trip and enjoy your time with family. I love all of your designs and would love to be the new owner of a pillow. Pick me, pick me, pick me !!! Would love to have a pillow. Have a great trip! They are so pretty! There's NO WAY I could ever stick a pin in one of these sweet pillows! Have fun on your road trip! These pillows are adorable! Please enter me in your giveaway...Thanks. Please add me to the list, I would love to win one of the pillows. Have a safe trip and enjoy ! Hey, I'm in Nashville!!! I would love a chance to win a pillow. How sweet! Enjoy your trip and have safe travels. Have a great trip! And thanks for offering this giveaway! I love the little pillows!!! Oh I would be thrilled to win one of those adorable pillows!! Love the beach house line and the pillows are lovely! Alma, I hope your having a wonderful time with your family. I miss Tenn. Both my daughters were born there. Have you been to Gatlinburg? My favorute spot is Wears Valley. Love the pillows!!! Where can we buy these? Oh, I heart them both...it would definitely be a treasure...and yes, I love alphabets! Charming! I would be happy to win a sweet little alphabet pillow. Those pillows are so gorgeous I would love to be the lucky new owner. One can never have enough pillows...especially when they're this sweet! Have a great trip with your family! Alma, what gorgeous pillows. Hope you have a lovely weekend even though it will be fast and furious. Please put me in your draw. Have a safe trip and thank you for the generous giveaway! Thank you for the chance to win a pillow - they're beautiful! These are wonderful; I would love to win one. Thanks for offering. I just had a "John Denver" flashback after reading the title of your post, LOL! These are very cute pillows. Please enter my name in the draw. Thanks! Cute pillows! I'd love to acquire one of those! Have a very fun and safe trip! I love reading your blog and I would love to be the lucky one for the pincushion. What a great little pillow/pincushion. I'd love to win one. Have a great trip! I hope you have a safe and happy journey with your son and I would LOVE to be included in the draw for the gorgeous cushion. the best blog. Have a good trip and drive safely. Have a great trip and please pick me for the way too cute pillow when you return. I love your beachhouse fabric line. Thank you! Take care on the trip! Enjoy your trip Drive safe The pillows are lovely I would love one Please. Alma, they are both wonderful little pillows! Pleae enter me for a chance to win. If you come with your son to Chicago, I would love for you to visit my shop in Lemont, IL if you get the chance! I just opened last November! Love alphabets. I have the perfect place for one of the pillows! Thanks so much for another fun giveaway - I would love to enter. Can one possibly have too many pincushions? I think not. Your blog never ceases to be inspiration to get OFF the computer and back in the chair to stitch. Thanks much!! Enjoy your family and your quick trip on a jet plane. Count me in on your alphabet cushion. Sweet!! Thanks again for offering us a chance. Take Care! These are so pretty, I would love to own one! They really are lovely, I would love to be in the drawing for one of the pillows please. Thank you. What delightful little cushions/pincushions. Have a safe trip. Thanks for another give-away. Please add my name to the drawing. Have a safe trip! The pillows are gorgeous! I hope you have a safe trip to Knoxville! That is home for us, and when we retire from the Military, we will be back there. Hope to meet you in person one day. They're so sweet!! I love them . Enjoy your trip. 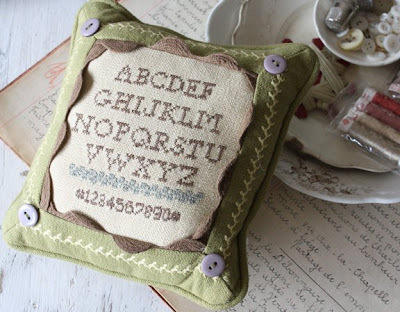 Strange that you should mention alphabets as my DH once asked me why everything I stitch has the alphabet on it! LOL they just don't "get it" do they? I'd love to be in with a chance to win one of these lovely pillows. I love the little pillows, especially the blue/brown one and would love to be entered in your drawing. Have a great trip! I just love them both ! And have a lovely time with your family. Hope you have a great time - safe journey. I would love to have a chance to win a little pillow, so please include me in the draw. I'm sure there's a spot in my sewing room for one of those! How cute. Hi from Spain. I love pincushions.Beach House fabric line is fantastic I bought some of its charm-packs and made a block-roll to keep all my cross stitch works and it looks great. The pincushion would match perfectly. What a cute and original pillow. Like the Rick Rack and the buttons. I would LOVE to own this pincushion and yes it would live on a shelf to admire every day! As soon as I started seeing these in market photos I wanted one! pick me!!!!!! I would love the chance to win one of these gorgeous little pillows Alma! Thank you. I would LOVE to win one of these gorgeous pillow. Hope you have a lovely time! Peggy in Ireland! These pillows are so beautiful. Thanks for this gieaway! Please add my name in the draw. Would I like to be put in a draw for a pillow? Of course I would please, I love everything Blackbird! Still thinking about magnets from yesterday's post (well I think it was yesterday here in Wales). Perhaps you already do this, but I'm new-ish to cross stitch and keep loosing my place on my chart. I got two magnetic strips ready to make the needle holder and found that putting one on the back and one on the front of a cross stitch pattern makes a wonderful place-keeping marker as well as a place to put my needles! Have a nice trip! and thank you for this giveaway! Both pillows are so beautiful! As i love birds, especcially blackbirds, you can imaging i fall in love with the blackbird designs ;first as a pachworker and the last years as a cross stitcher. Hope you have a lovely trip. please enter my name into your draw. You can NEVER have too many alphabets! Very lovely pilows,maybe I'm lucky? Beautiful! Have a safe trip. What a great little pincushion. I'd love to win one!!! Have a great trip to your family! Thank you for your generous give away - I do not yet have a pillow with an alfabet on it, so I would love one. Have a great and safe journey. Have a lovely trip and love the pillows. Everyone! Sing along to the Jackson 5's ABC (cause it's true, we can NEVER have enough alphabets)! a-b-c, 1-2-3, I love BBD's! Thanks for the chance and I wish you safe and happy travels through the beautiful Volunteer State! Have a great time in TN! Hey, when in Nashville, stop in & see my newborn triplet grandsons, will you!?!?!!?! Give them a big grandma hug & kiss!!! I'd love to go in the draw, I don't even have one alphabet, isn't that sad. Have a good trip. Have a wonderful visit with your family and a safe trip. Very cute pillows! Keep me in mind! I love the little sampler pillow! Have a safe trip and thanks for the give-away! Great give-a-way offer - please include me in your drawing! Love reading your blog each morning - it helps get my mornings started just right! Have a safe trip! I love Tennessee, it's so pretty. I'd love to be entered in the drawing. Would love to have a pillow. I love your designs and would love a pillow. Have a very safe trip. Have a safe trip. and I would love to be entered in the drawing for the pillows. thank you for offering. Those little pillows are just the sweetest things! I'd love to give one of them a home. Have a safe trip and enjoy spending time with your family! Thanks for offering this, they're adorable! Please enter me too. Have a great trip! I would love to win one lovely pillow. Keeping my fingers crossed! My husband always asks "why don't you stitch something that actually says something?" He just doesn't understand my allure to alphabets. I hope that you have a safe trip and a wonderful time visiting your family! Enjoy the time with your family - even though it's just a few days. The pillows are wonderful...thank you for thinking of us. i love the colors in these pillows. Thanks and have a safe trip. Enjoy your short visit with your family. I would love to win a pillow. I would love one of those cute little pillows and you do not have to iron the rick rack down on mine. :) Thanks so much! Hope I'm a lucky pull!! Please enter me for a pillow! Don't have any yet! Hope the trip is enjoyed by all! The pillows are so cute. I would love to win one. Precious little pillows. Have a safe trip. Have a safe trip! I love those little pillows - the teal one would suit my decor perfectly. I would love to win one of your little pillows. I have stitched several reproduction samplers and the pillow would go nicely with it. Thanks so much for the opportunity to win a pillow. Please include me in your drawing. Love the pillows, I would love a pillow, alphabets are one of my favorites' Have a nice trip! Hi!!! Love those pillows. Have a great trip. Love the brown and blue! Please enter my name in the drawing for the pillow. So CUTE! They are delightful and I would love to give one of them a good home! I absolutely would cherish one of these!!! Your creations are awesome! I love the pincushion! It's just the cutest. I can always use another one. I seem to keep misplacing mine. Smiles. Love the pillows and would love to have one! Have a wonderful trip! Love reading your blog! Cannot describe the joy you bring by making the BBD patterns. I am ao member of the Stockingclub with Liezbeth: they are too cute!! High heart melting risk :)) fill your heart with family love during your visit! They are so pretty! I'd love to win! I'm sure I could master my ABC's if I win one of those lovely little pillows. I would sleep with it. I love your blog. Thank you for all the free things you put out for us. I would love to have one of the little pillows. Have a safe journey! It's always nice to just get away for a few days. Love, love, LOVE the little pillows!!! OOHHHH!!!!! How lovely! I really do hope it is my turn to be one of the lucky winners! Enjoy your trip and the time with your family. How generous of you. Please enter my name & have a fun, safe trip. They are both adorable. I would love to be included in the drawing. They are so cute. Please enter me in the drawing. LOVE these pillows! BB Designs is one of my favorites. Would love to add these to the ones I have made! Alma, have a safe trip and a happy visit with your family. Have a fast but wonderful trip with your family, I would love to win one of your pincushions. I love quick car trips. Hope your trip is safe and fun. The pillows match my new bedroom. Thanks for the chance to win. Have a great and safe time on your road trip! What a road trip. Don't you just feel like you need a vacation from vacation sometimes? Please enter me into the giveaway. The pillows are adorable. Your projects are awesome, love all the primitive patterns. OHhh these pillows are too cute, would love one. Have a safe trip!!! I'm sorry you're coming to Nashville as I'm leaving on vacation. I live in Franklin, just 20 miles south. I love pillows and anything Moda. I've drooled over these since the first time I saw them. Yes, I'd love to have one! Have a safe trip. Please enter me in your drawing. You can never have too many pincushions. Thanks! Love you little pillow-pincushion. Thanks for the chance to win one. Wow!!! Please add my name to the draw! I love the beautiful pillows!!! Thanks in advance and have a great trip. Have fun on your trip. And ohmygoodness I'd die of happiness if I won either, but the brown linen would send me over the moon. Happy travels! Would love to call one of those pillows mine . . . The pillows are darling. Have a wonderful trip. I hope you have a safe trip and enjoy your time with family. Vists are always too short. Have a fun time Alma! You can never have enough alphabets, please include me for the giveaway. Thank you!! Wishing you a lovely trip and a nice visit with family! I am picking a spot for the beautiful pillow now! LOL Positive thinking is sure to win it for me right? Beautiful, beautiful! Thank you for bringing loveliness to a world of trouble and confusion! Have a safe and fun mini vacation! I would love one of those beautiful pillows. I just finished the eiffel tower pincushion. It was fun to stitch. Don't think I have a chance of winning - but I'd love one of the pillows. To cute. Have a safe trip. I just love these cute little pillows. The idea of setting them on a shelf is great. Have a safe trip. I would love a pillow. Have fun on your trip. But, of course and what sweet alphabet pillows they are too! They are really cute pillow's - I would love one!! Have a great trip! 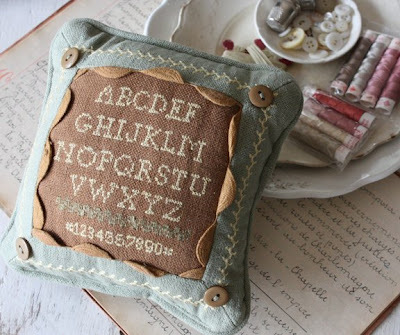 I would love to have one of your alphabet pillows. Please include my name. Love, Love, Love these cushions! Enjoy your time with family! Enjoy the time with your son. As I well know those times slip away too soon. I have been enjoying your blog, and would love to make a home for one of these treasures in my home. You are so generous! I am so addicted to Blackbird Designs and am currently working on Berries with all those cute baskets! Just love all the designs. I hope that maybe I'll get lucky and my name will be drawn for one of those cute pillows! Thanks so much and have a safe trip this weekend. Love the pillow, please count me in! Who couldn't use another alphabet??? Enjoy your visit! Oh, cute! Sign me up, please. Hope you have a great trip. What a sweet giveaway! I would love to be included.. I'm very happy to join in this drawing. Those are both sooooo pretty! I love all that you do, your patterns are wonderful, thanks for sharing! I hope you have a nice trip, come home safely. Love the colors used. Have a great weekend. Please would you consider picking me? I would love to be entered in your drawing! Alma - what a delightful little pillow! Please throw my name in the hat for your drawing. I'd love to be in the draw - enjoy your trip! One can never have too many alphabets! LOVE the new fabric! They are very beautifull, Iám a great fan of all your designs. The pillows are adorable. I would love to win one. I am stitching on a Loose Feathers project from last year - "When this you see" and love how it is turning out. Hi Alma! the pillows are so sweet! Please enter me in your drawing for one of them! I love all the fabrics you use! I would love to add a beautiful new pincushion to my collection. 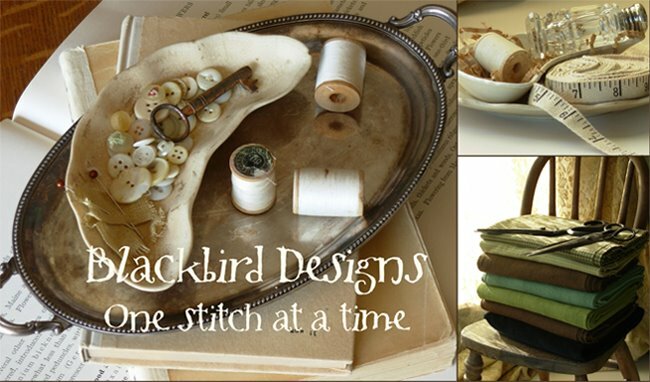 Blackbird Designs is my all time favorite! I am but one of many who would love to win one of your pillows! Please include my name in your drawing. What cute little pillows, please enter me.